Microsoft Office 2007 (officially called 2007 Microsoft Office System) is a Windows version of the Microsoft Office System, Microsoft's productivity suite. Formerly known as Office 12 in the initial stages of its beta cycle, it was released to volume license customers on November 30, 2006 and made available to retail customers on January 30, 2007. These are, respectively, the same dates Windows Vista was released to volume licensing and retail customers. 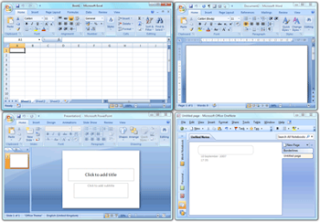 Office 2007 contains a number of new features, the most notable of which is the entirely new graphical user interface called the Fluent User Interface (initially referred to as the Ribbon User Interface), replacing the menus and toolbars – which have been the cornerstone of Office since its inception – with a tabbed toolbar, known as the Ribbon. Office 2007 requires Windows XP with Service Pack 2 or higher, Windows Server 2003 with Service Pack 1 or higher, Windows Vista or Windows 7. Office 2007 is the last version of Microsoft Office available for Windows XP Professional x64 Edition.